This week has been a roller coaster. My husband and both my boys have the flu, and I am now the last Collazo standing. On top of that, my older son turned twelve today AND performed in our school's production of Hairspray, despite his flu. He played Edna Turnblad, a middle-aged, overweight housewife played by John Travolta in the movie. He did a FABULOUS job today, but he was absolutely exhausted afterward. He has another performance tomorrow night, and I plan to keep him home tomorrow during the school day so that he isn't wiped out by the time he's onstage in the evening. Which brings me to today's post. I was out some of today and will be out again tomorrow. I know flu and sinus infections and other respiratory ailments have been rampant in our school, as I am sure they are also rampant at your school. It's just that time of year. I also have three library classes tomorrow. 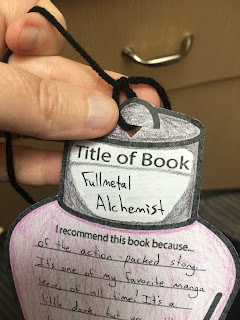 So today, I am sharing an idea that will engage both elementary and middle school students. 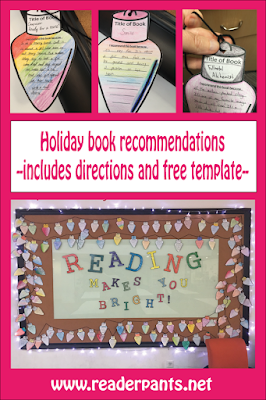 It's easy to implement and doubles as a holiday-themed bulletin board. Even better, it would make an easy-prep sub activity for libraries or classrooms. 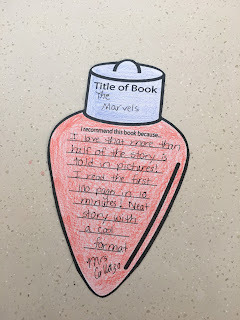 If your students read any books and can write a sentence or two, they can do this activity. 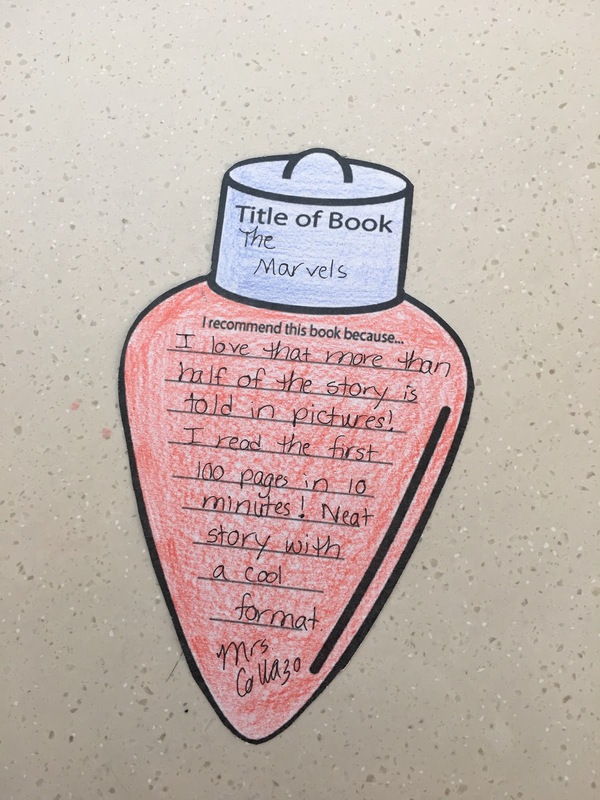 sample light bulbs--I recommended 3 different books, colored the bulbs, and cut them out to show as examples. and light bulb templates FREE from my TPT Store. "These Books Will Brighten Your Day!" "Need a book for the holiday break? Some recommendations..."
*Yeah, I'm not so great at these phrases. Feel free to comment with some better bulletin board titles! I set up the bulletin board before the lesson so I could refer to it while giving instructions. I did not cover my bulletin board since it is glass. The whole thing was pretty self-explanatory once I showed my examples. 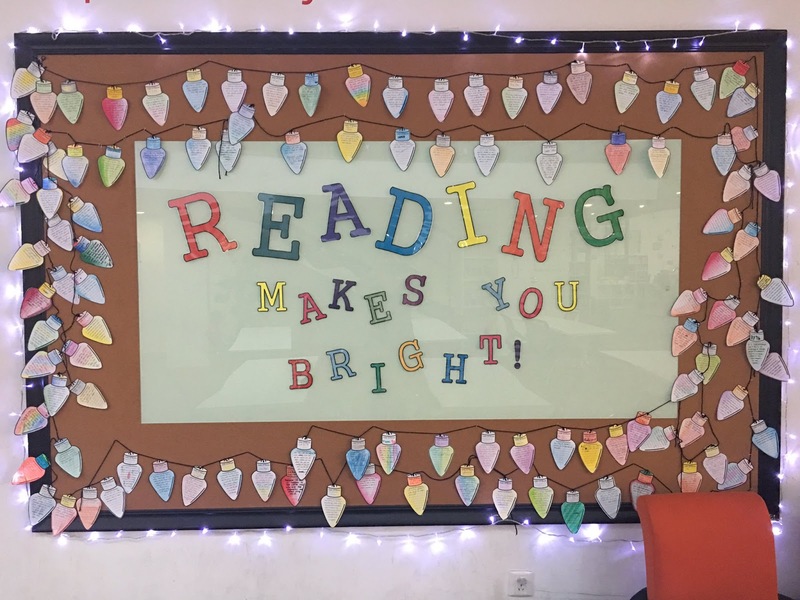 Once you have some of the bulbs hung up, you could simply give the students time to explore the board to see how the other students created theirs. 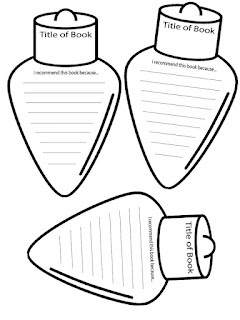 Though I included some colored bulbs in the template, I recommend you use the ones the students can color. They loved the coloring and did some beautiful designs! I told my students they could recommend any book in the library. 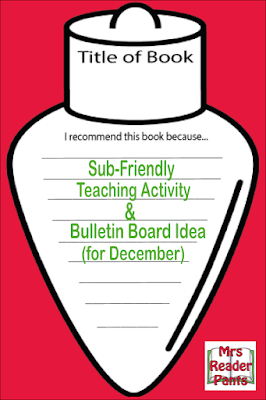 This is important because other students may ask for the book they are recommending. I want to be able to provide it! For the yarn, I found it better to tie a loose knot around the top of each bulb. This will help prevent slipping and keep the bulbs right where you want them. 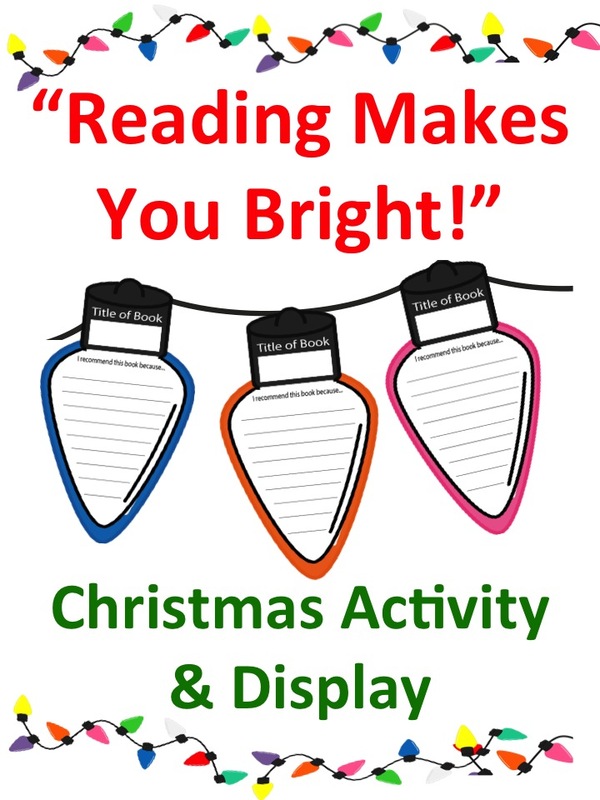 Hang the bulbs as students finish, or as quickly as you are able. It's only December for a short while! Once January rolls around, it will be time to change out the display. 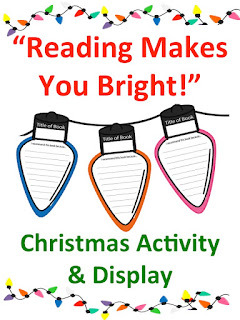 Take photos of the students creating their bulbs, and hang the photos on the bulletin board with the bulbs. Students love the photos and will be more likely to really look at the recommendations. Here's the final photo, and yes, those are Christmas lights around the border! Okay, it's time for all you creative people to strut your stuff! Do you have a better "catch-phrase" for the bulletin board? Thank you, thank you. I'm home can't stop coughing, hope to be back Monday. And will share with my students at both school's. Appreciated.